Resolved to organize your research this year? Try these tools! Find yourself consistently performing searches in EBSCO or CSA? Take a moment to set up a personal log-in. This feature allows you to store records in organized folders, save searches, share your work, and set up alerts. Set up search alerts in your favorite databases to automatically receive new articles on your research interests. Alerts can be set for particular journals, specific search strings, or more general topics. The alerts can be received on a daily, weekly, biweekly, or monthly basis and received within the database or via email or RSS feeds. If you would like assistance with setting up alerts, please email Kristyna. Citation managers such as Refworks and Endnote are useful tools for collecting, storing, and organizing article and book citations. You can also use these tools to generate your bibliography in APA style, and to automatically format your in-text citations. 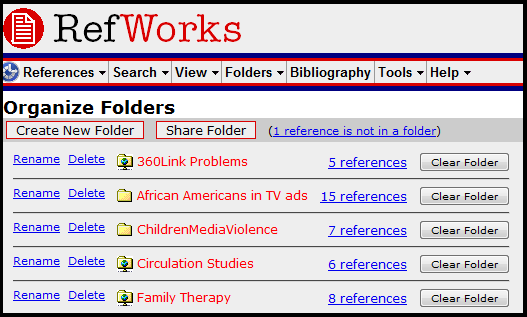 Refworks is a web-based tool that is generally simpler to use than Endnote. I highly recommend it for students working on research products. The RefShare feature allows for some collaboration among students. Graduating students are encouraged to back-up their work as they will not have access to Refworks after graduation. Endnote software is installed on your computer and is more advanced than Refworks. Faculty tend to prefer Endnote, and I would recommend it for students considering continuing studies after graduation, as the software and your citation library are housed on your computer, giving you permanent access. An RSS reader will aggregate all of your favorite RSS feeds into a single site or email alert. The site or alert will showcase the headlines from your favorite blogs or websites. Any site that provides an RSS feed can be entered into your reader. For Google users, try Google Reader. Other popular sites are outlined on the Top RSS Readers post from Why RSS? : The Really Simple Guide to RSS. iPhone users may be interested in the 5 Best RSS Feed Reader Apps from CallingAllGeeks. This tool allows you to connect with other researchers in the style of a social networking site, but with targets for specific disciplines and topic areas. The second aspect is a toolbox for online collaboration on research projects. Perhaps the most useful feature allows group members to check out a document, preventing duplicate effort on the same draft. This web-based product allows you to share your screen after a small download and installation. Others can access your screen cast without downloading anything. The free version also features live chat and recording options. The free version of Jing allows you to record video screen casts with audio up to 5 minutes in length. Videos can be shared from a web-based library.